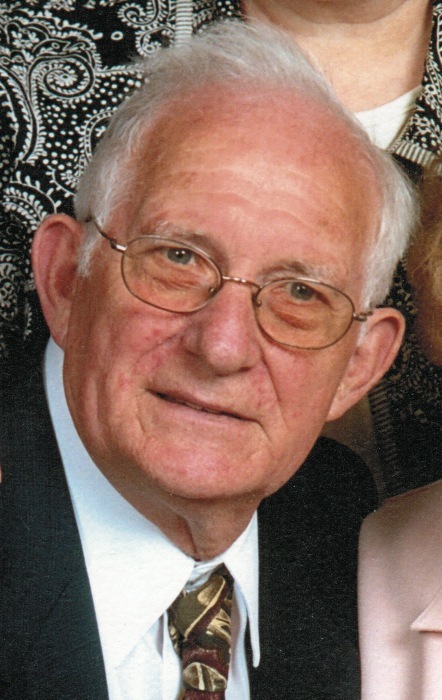 Obituary for James W. Claycomb | Frederick Funeral Home, Inc.
James W. Claycomb, 87, of Latrobe, passed away Thursday, June 28, 2018, in Excela Health Latrobe Hospital. He was born Nov. 4, 1930, in Derry, to the late James Edward Claycomb and Susan Josephine (Hayline) Claycomb. He was retired from Latrobe Steel. He was a member of Bethany United Methodist Church; Latrobe American Legion Post 515; Loyalhanna Lodge No. 275 F. and A.M.; 32 Degree Mason with membership in the The Valley of Pittsburgh Consistory; Syria Shrine; Tall Cedars of Lebanon; and the Latrobe L.A.M.A. 's Club. He was a veteran of the Army. In addition to his parents, he was preceded in death by his wife, Delores L. Claycomb, in 2017; and 13 brothers and sisters, Frank, Ernest, John, Eugene, Dwayne, James, Lois, Latha (infant), Florence, Betty, Sarah, Mary and Thelma. He is survived by two daughters, Kathy S. Claycomb, of Latrobe, and Janice C. Kirby and her husband, Charles Kirby Jr., of Medford, N.J.; one grandson, Charles "Chaz" Kirby III and his wife, Sarah, of Medford, N.J.; three great-grandchildren, Wielond, Ewan and Sidney; a brother-in-law, Joseph N. Bridge and his wife, Eleanor; as well as several nieces and a nephew. Visitation will be from 11:30 a.m. to 2:30 p.m. and 6 to 8 p.m. Sunday, July 1, 2018, at FREDERICK FUNERAL HOME INC., 1543 Ligonier St., Latrobe, PA 15650. A funeral service will be held at 10 a.m. Monday, July 2, 2018, at Bethany Methodist Church, with the Rev. Les Hutchins Jr. officiating. Everyone is asked to go directly to the church. Burial will be in Unity Cemetery, Latrobe. Loyalhanna Lodge No. 275 F. and A.M. will conduct a Masonic funeral service at 6:30 p.m. Sunday in the funeral home. Military honors will be conducted following the funeral service at 10:30 a.m. Monday, July 2, 2018, in Bethany United Methodist Church by the Latrobe-Derry Veterans Honor Guard. Memorial donations in his name should be made to Bethany United Methodist Church, 2415 Laveen St., Latrobe, PA 15650. To purchase flowers or send condolences, please visit www.FrederickFuneralHome.com.